Swedish police say a man detained after Canadian authorities were told he was carrying explosives on a Pakistan International Airlines jet has been released in Stockholm, where his flight from Toronto to Karachi was diverted Saturday. The RCMP now say they're investigating whether the incident was a "terrorism hoax." No explosives were found on the man or on the plane. 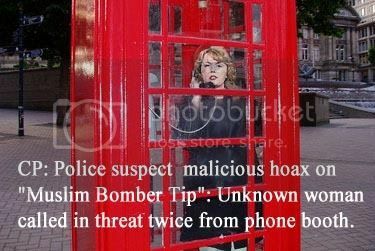 The tip was "called in by a woman in Canada," police spokesman Stefan Radman said. The anonymous woman caller called twice Friday to say a man on the flight had explosives. This page contains a single entry by Balbulican published on September 26, 2010 10:16 AM. The mind of a Blogging Tory was the previous entry in this blog. The Simpsons vs. the Alberta oil sands is the next entry in this blog.